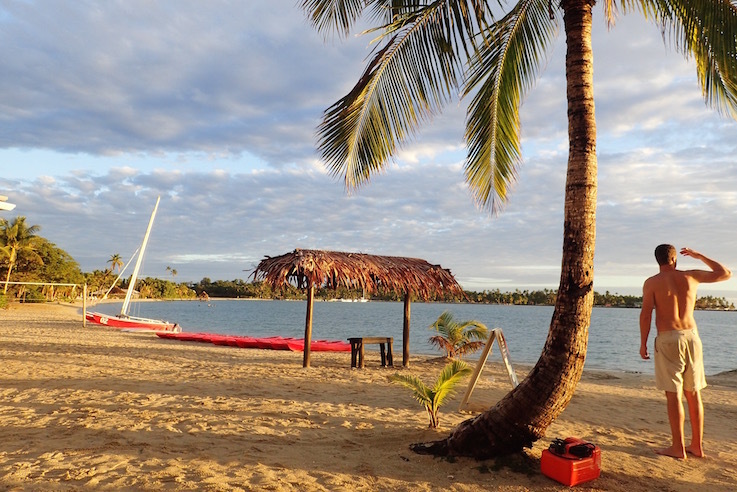 Fiji, Mamalucas Islands: Dusk at Musket Cove Beach, aka Malolo Lailai. Checking out of Fiji is a snap at Vuda Point Marina. 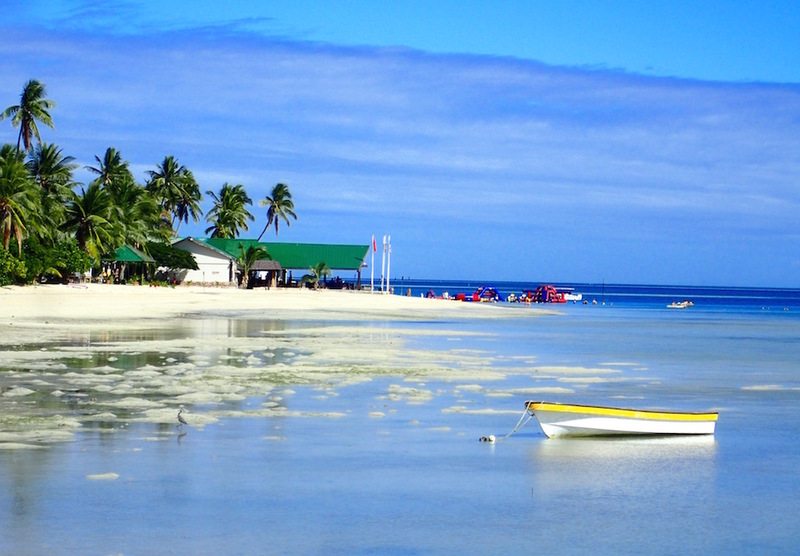 The hitch is that Fiji officials expect you to leave immediately after checkout. Not just the marina, the country, with no dilly-dallying. For many places, that poses no issue. Fiji, however, is wrought with boat-wrecking poorly charted reefs. Most sane sailors prefer to traverse them in broad daylight with a sharp eye on the water ahead. 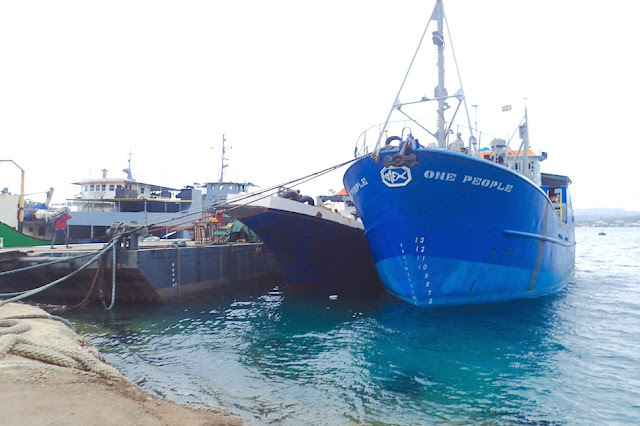 From checkout to reef clearance, from most spots in Fiji, that's simply not possible. 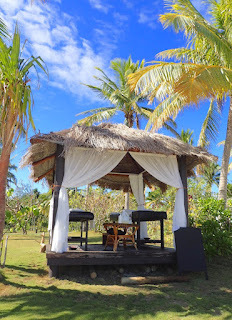 Fiji is a popular place for destination weddings for Kiwis and Ozzies wanting a warm winter wedding full of frolic and fun. Bachelor party at Musket Cove, Fiji. 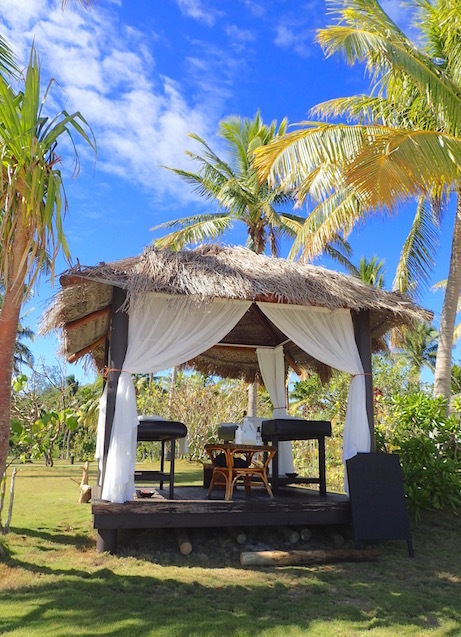 Ahem, we're resort crashers, not wedding crashers - well - except in French Polynesia. She looked like an escapee from the bachelorette party. "Hide in plain sight, you're far more likely to get in trouble if you're anchored off by yourself" advised Keith of Sadiqi when we mulled over whether to stop anywhere in Fiji before checking in. That struck us as excellent advice for leaving. Like Thomas Crown's "Man in the Bowler Hat" scene, it's far harder to get caught in a crowd. 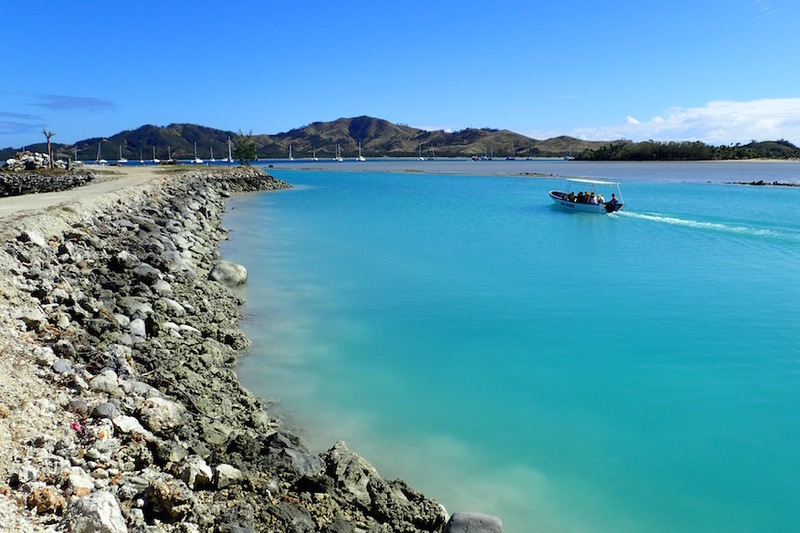 So we hopped off to nearby Musket Cove, a few hours passage and a closer exit to the reefs leaving Fiji - one we could make in daylight the next day. There were tons of boats anchored in Musket Cove, not surprising given it's a posh island, but cheap for cruisers. 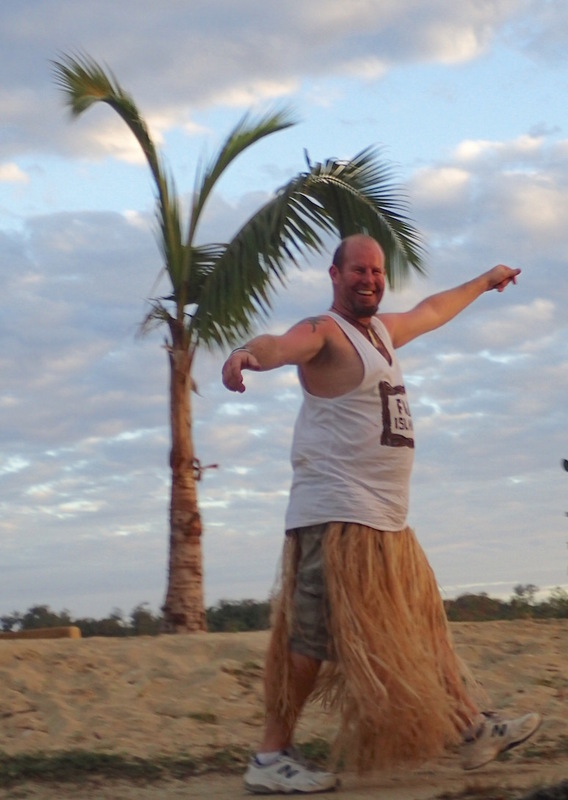 Plus, that meant we got to sneak in a visit to Fiji's Mamanuca Isles before leaving. We were delighted to bump into cruising friends Minna of Kairos and then Steve and Patty of Armagh there. Wayne was pooped and didn't want to lower our dinghy, as we were illegals and setting passage the next day out. was willing to ham it up for the camera. I hitched a ride from our gracious neighbor Minna, who was happy to take a walk with me ashore. I wanted to stretch my legs before being restricted to our boat for several days on passage. Ashore, we encountered Steve and Patty. 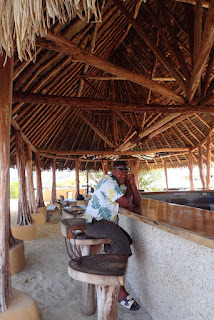 They gave me a ride back to Journey, where we imbibed in sundowners and played a bit of catch-up. 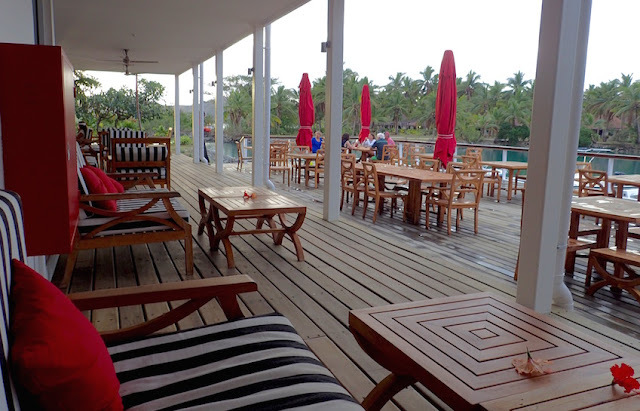 Musket Cove Fiji's swanky patio restaurant. 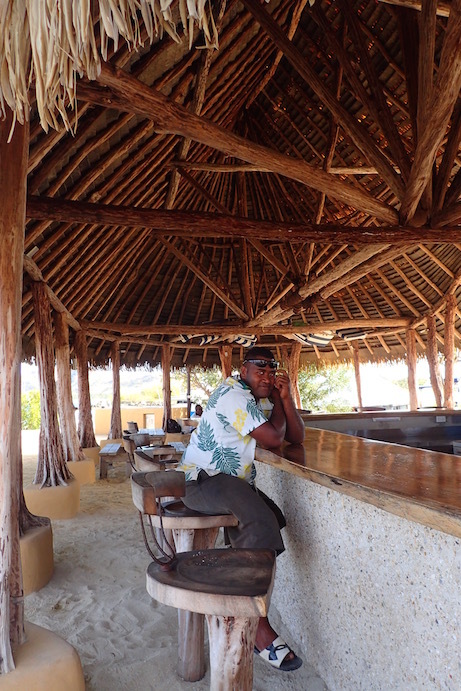 Gotta have a beach bar to be a resort. Ta-da. didn't dare splash at the swim-up bar. "Come check out the book exchange," Patty urged, knowing I'm a total sucker for them. We had plenty of time to clear the reefs in daylight before we took off, so we came ashore with Steve and Patty. After spending several days enjoying Musket Cove, they were also keen to show off the island's pools, store, restaurants and beaches. We agreed, it sounded like fun. Steve chauffeured us in, tied Armagh's dinghy off at Musket Cove's dock and we all ambled ashore. "Here's where the book exchange is," Patty said, leading us into Musket Cove Marina's office. next door on Malolo Lailai, Fiji. Musket Cove charges cruisers a modest $15 USD fee for using their facilities. Really, though, we weren't using a mooring, their toilet, their showers, their pools. More importantly, we didn't want to blatantly leave a paper trail of our illegal presence after checking out. "What boat are you from?" bellowed Mr. Officialdom from the Musket Cove office. "Uhhh, Journey," I stammered, figuring it was a common boat name but mostly I just don't lie well and wasn't thinking quickly enough. "I don't have record of your checking in." came the retort, as we were beating a hasty retreat. 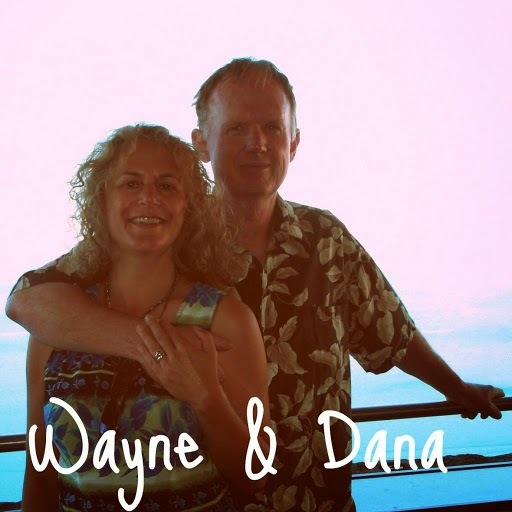 "That's because we're leaving," Wayne, far quicker and wiser than me, replied. And so we did. Quickly. 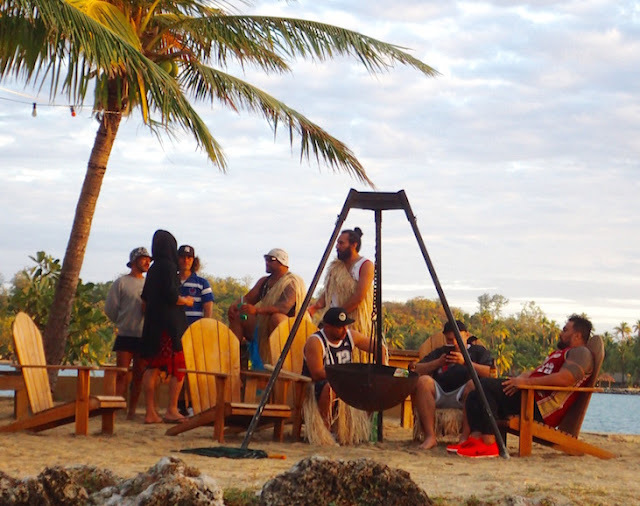 We zipped into this Malolo Lailai spot, which was off Musket Cove's property. Fiji. 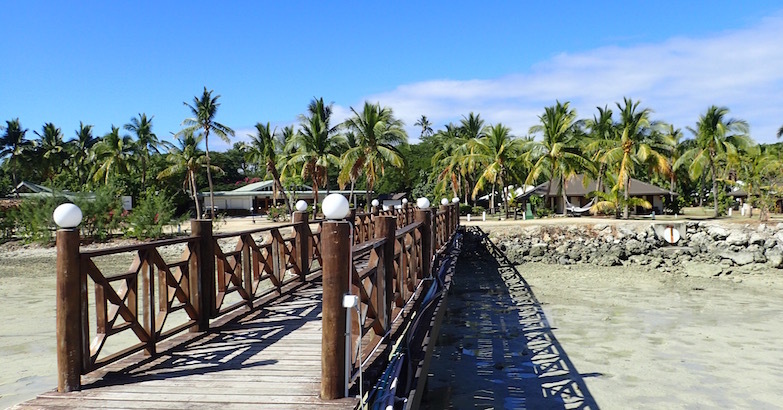 Ahhh the bridge to safer ground on Malolo Lailai, Fiji. Ok, we did leave to re-dock at another resort on the same island.... There are several there on Malolo Lailai. 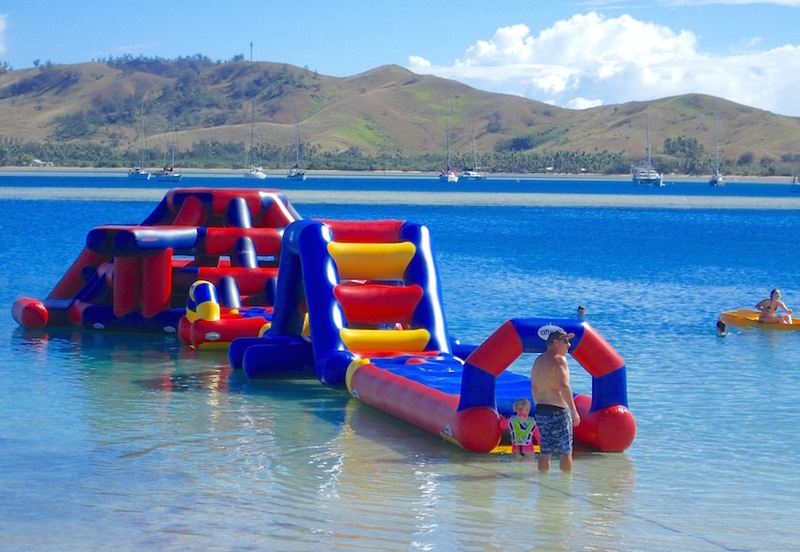 Beach playground, Malolo Lailai, Fiji. Near, but not on, Musket Cove. 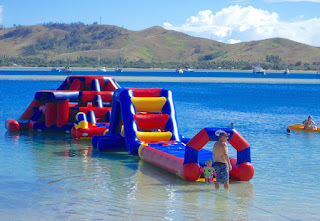 Water toys even bigger than Blue Lagoon Resort's in Yasawas. Fiji. We waked past the pools, water toys, cruised the bungalows, wandered the beach a bit.... Just gawked and had a great time in the sunshine. No one busted us, perhaps because we steered well clear of the Musket Cove Marina office and studiously avoided dipping into or even coming too near their awesome swimming pools. 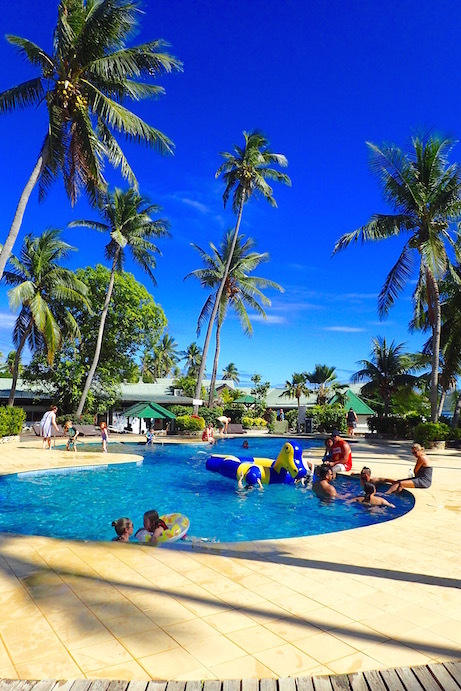 Serenity, just a stone's throw away from kid central, Malolo Lailai, Fiji's Mamanucas. All too soon, we needed to push off to to time our passage departure. Steve and Patty returned us to our boat, where we bid them a fond adieu. to bring our massage oil! Fiji. 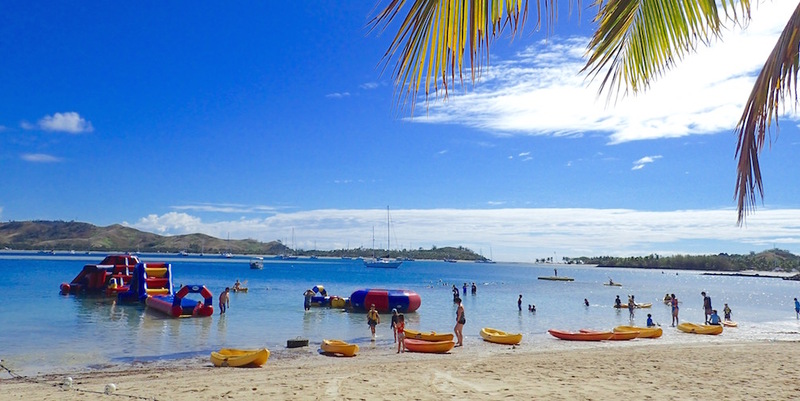 Other than our fear of getting more than a reprimand for not paying for Musket Cove Marina, our stop in Fiji's Mamanuca's Malol Lailai was one more sweet goodbye to a tropical paradise we hope to return to someday. Wayne and Patty lead the way down Malolo Lailai's beach. Fiji. 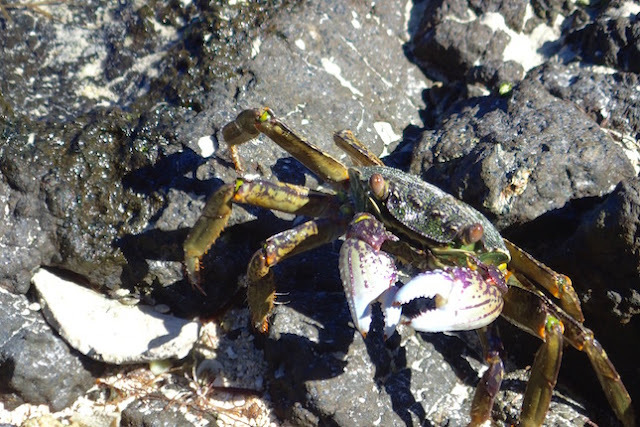 "Check out this colorful crab," a nice Ozzie family showed us on Malolo Lailai, Fiji.... And it was! Unfortunately it was big enough to freak out their older daughter, who was begging Daddy to carry her safely away, while her far less perturbed little sister beamed happily aloft in Mommy's arms. 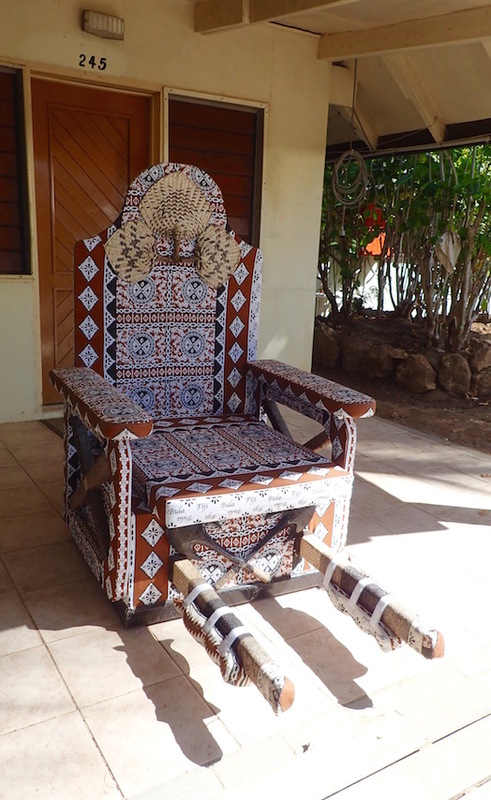 Fiji's Mamanucas. A recent retrospective of our brief stop at Fiji's Musket on August 1st and 2nd, 2016 (S17.46.316 E177.11.228) , this post was written while moored at Yachting World mooring S17.44.750 E168.18.729) in Vanuatu’s Port Vila. It will post while we're under sail to New Caledonia. There may be a few more Fiji posts to catch up on, and still lots of Vanuatu posts coming. 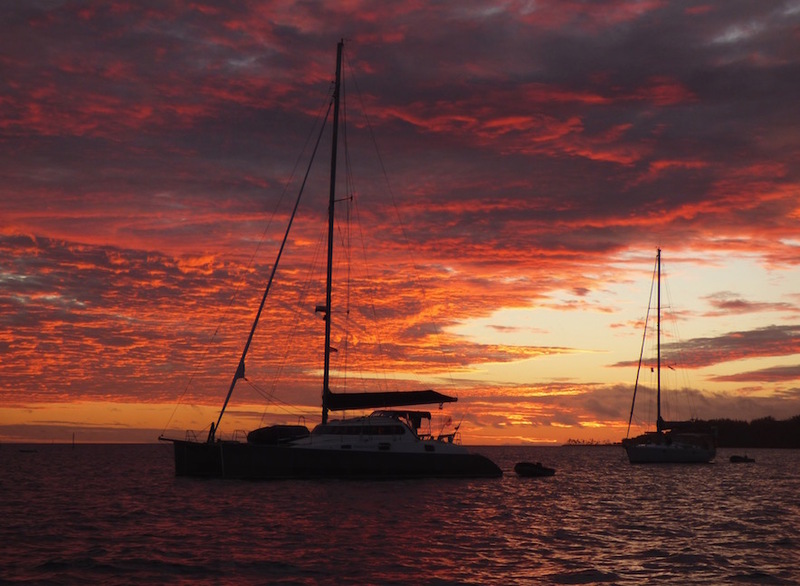 Musket Cove gave us one last specatular sunset in Fiji. We're underway to New Caledonia. 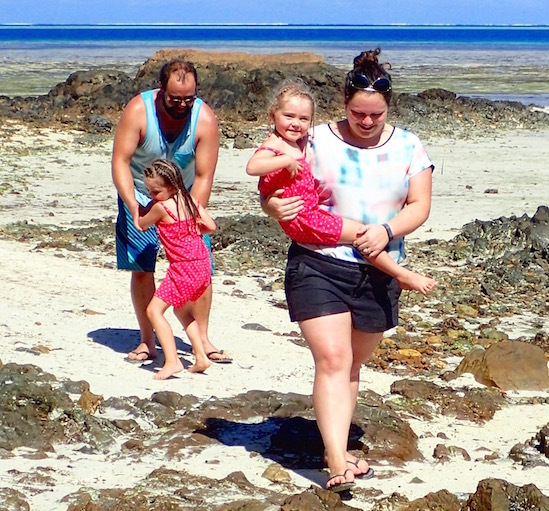 After New Caledonia, Australia, by December 2016 (but probably earlier). There, we plan to sell our boat, and go back to work, somewhere. Was this just for us? 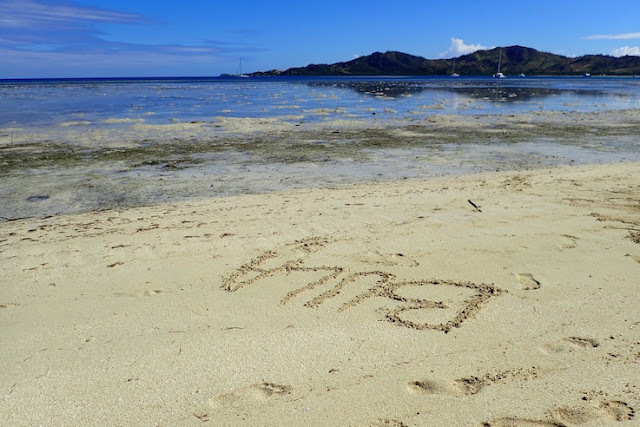 For our last walk on Fiji's sands? Malolo Lailai, Mamanuca, Fiji.